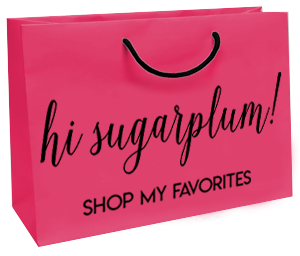 Sugarplum Style Tip | How to Layer | hi Sugarplum! Hey, hey, hey…I hope you all had a great weekend! We actually saw the sun for the first time in ages, and it was glorious. I think the entire Dallas metroplex rushed outside to enjoy it. I didn’t realize how much of my mood and attitude were tied to the weather, but those gray days were bringing me down! Obviously I won’t be moving to the Pacific Northwest anytime soon. 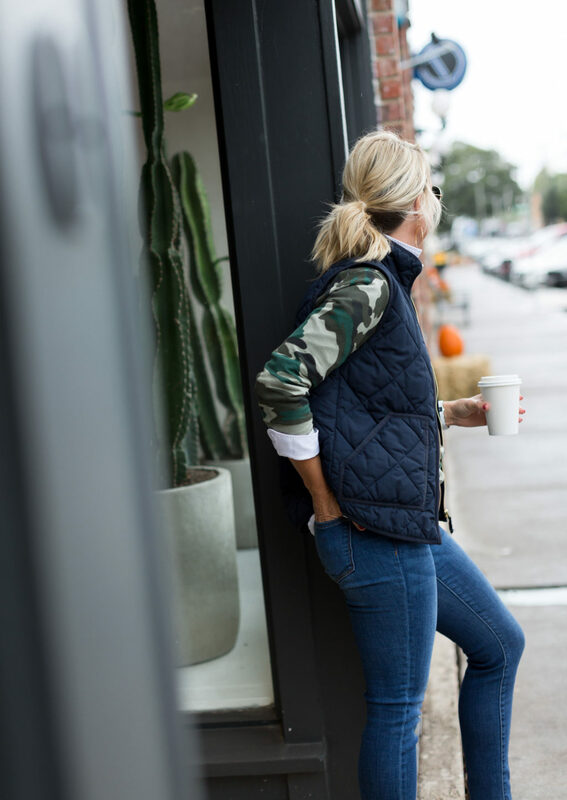 Our weather can literally change 30-degrees in a single day, so layers are key for staying comfortable. Plus, they have a way of making an outfit infinitely more stylish. 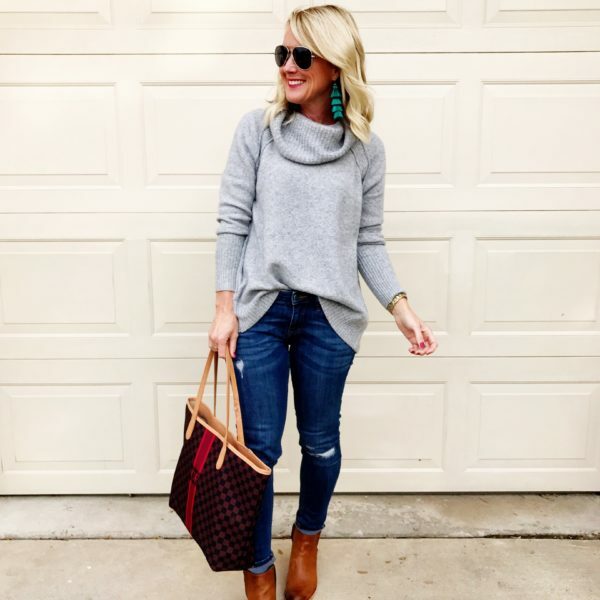 Here’s how the outfit comes together by layer…you can see how it just gets cuter with each piece. 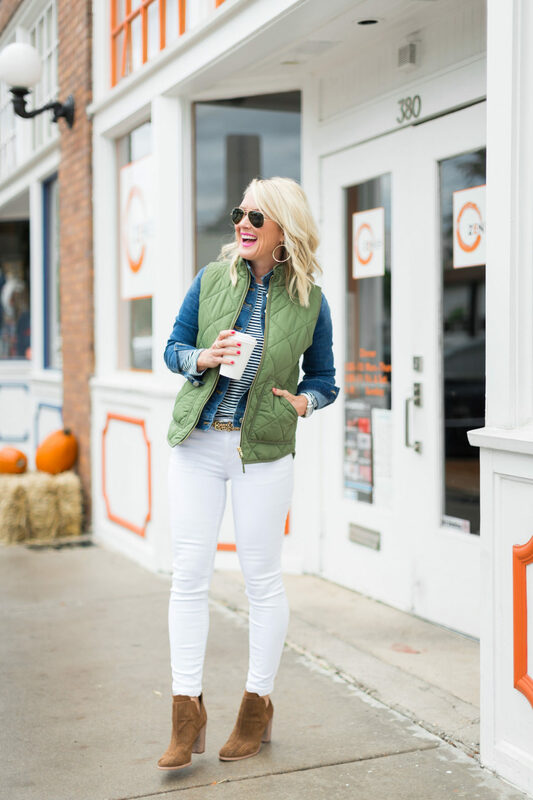 Puffer vests are my go-to layering piece, especially in transitional weather, and these quilted vests are my favorites. They’re the perfect weight and don’t add bulk. Fit Tip: I’m wearing XS in everything. 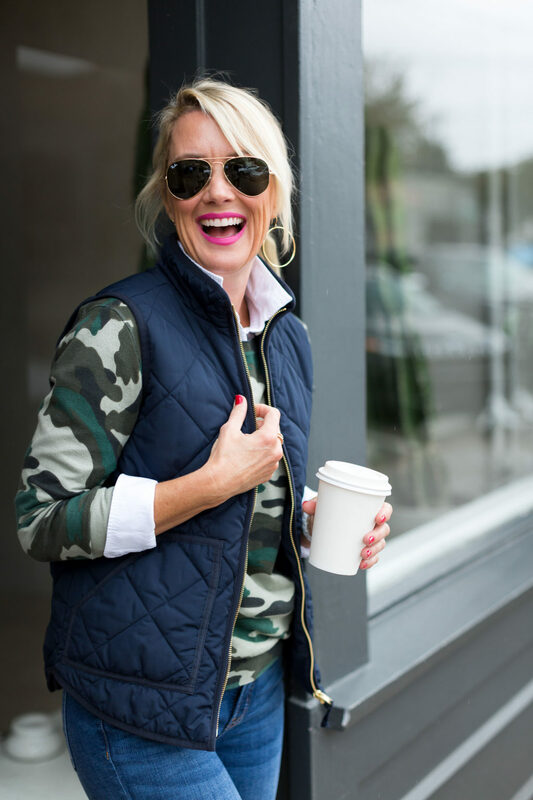 Use sleeveless shirts and vests to limit the number of long sleeves when layering on top. 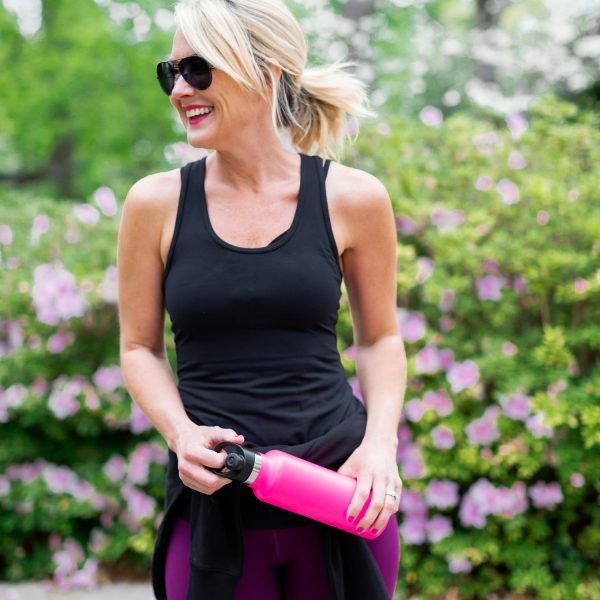 This will keep your arms from getting too bulky, and allows you to actually put move around normally! Alternate collars, mixing a crewneck with a collared shirt or turtleneck. Use a collared shirt to add a pop of color or pattern, and let it peek out at the neck, cuffs, and even around the waist. Either pop both collars, or fold the collars down together to keep it from being too messy around your neck. Use solid colors to break up the patterns. I typically alternate pattern and solid, but I don’t shy away from pattern-on-pattern. I just throw a solid in the mix to break it up some. I will usually pull my hair back if there are a lot of layers around my neck…this allows the clothes to shine, and keeps me from looking overwhelmed by clothes and hair. Leave the top layer open to allow the colors and patterns to show, and keep your midsection from looking too bulky. In this outfit, I popped both collars, alternated solid and pattern, and cuffed the sleeves for an added layer at the wrist. Okay, here’s another fun combo…this time, combining a tee, jacket, and of course, another vest! I added the leopard belt for a little more pattern punch…when in doubt, stick with two patterns. Just vary the scales to keep it from being too busy. Both collars are popped, and I rolled the jacket sleeve a bit to allow the stripe to show through at the arm. Since this jacket is so fitted, I could button it all the way and wear it like a shirt, too. 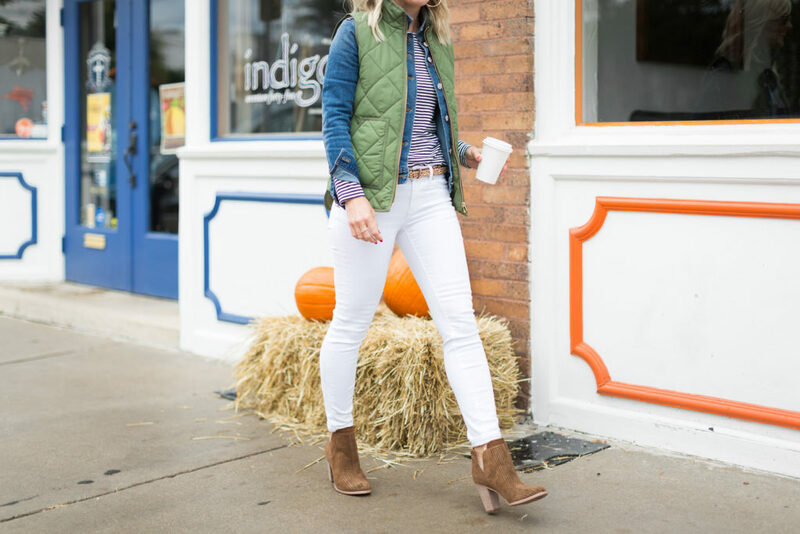 This is seriously the perfect jean jacket!! 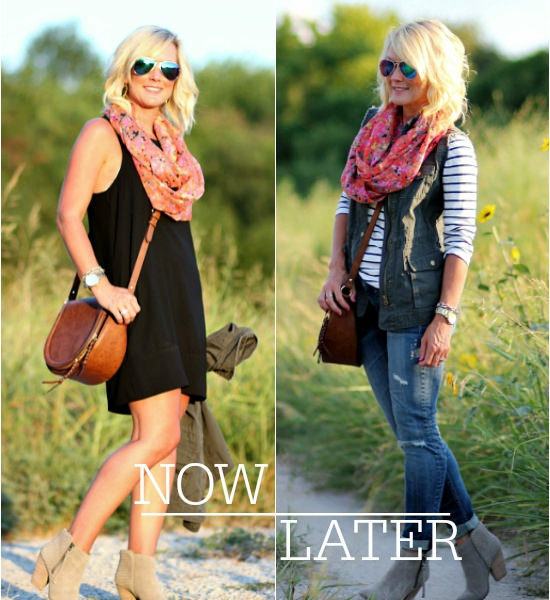 I’m crazy about the wash, and the stretchy fit is perfect for year-round layering. And of course, it comes with amazing Prime shipping and service! I started with the most fitted shirt, and layered up as the pieces got looser. 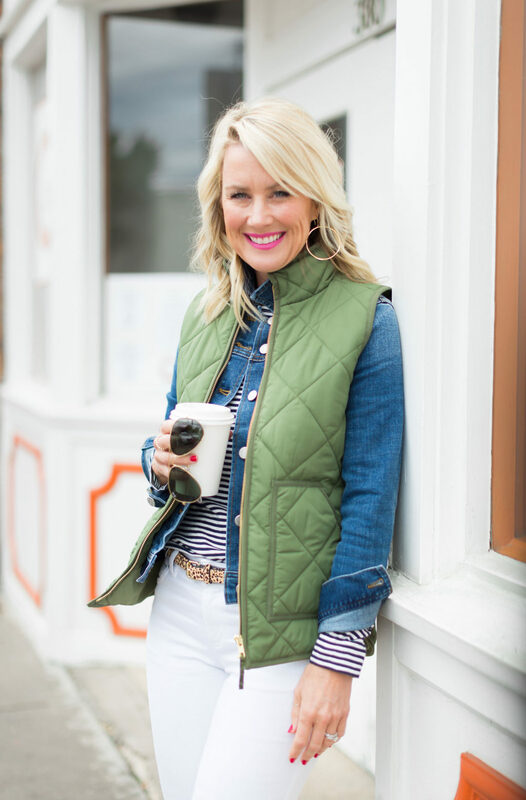 I own quite a few of these quilted puffer vests, but somehow didn’t have this great olive hue!? 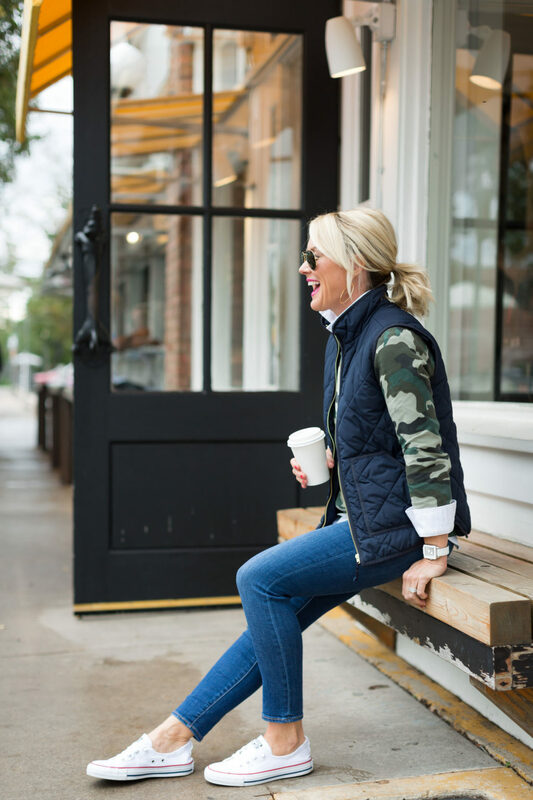 It’s the same color as a standard military jacket, and goes with virtually everything! It looks so cute with plaids, too. 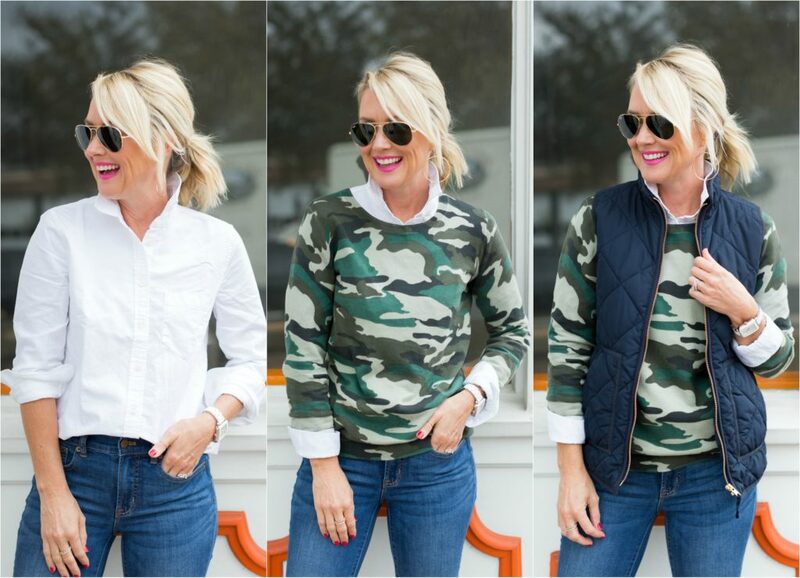 I could build so many outfits using just these pieces…that’s the great thing about layering! Individually the pieces are fairly basic, but when worn together they make fun, stylish outfits. Pairing new and different combinations is a great way to stretch your wardrobe, as well! Can you believe I found everything on Amazon?! I’m still giddy that J.Crew is available on Prime, and can’t wait for the new arrivals! 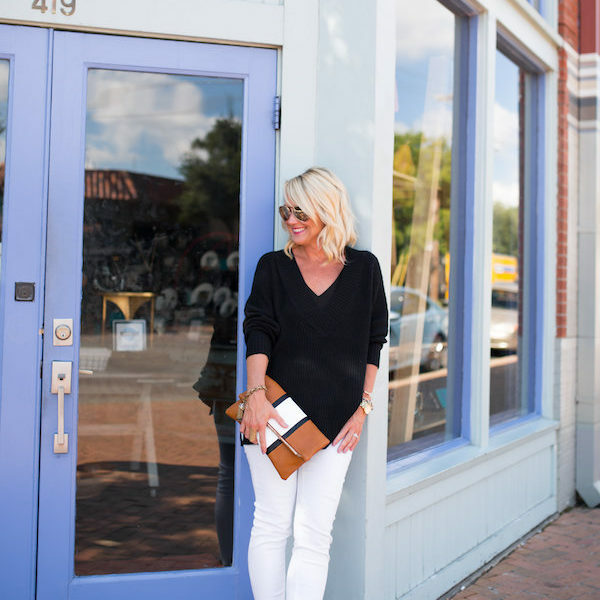 See more of my outfit combinations with these great pieces here. 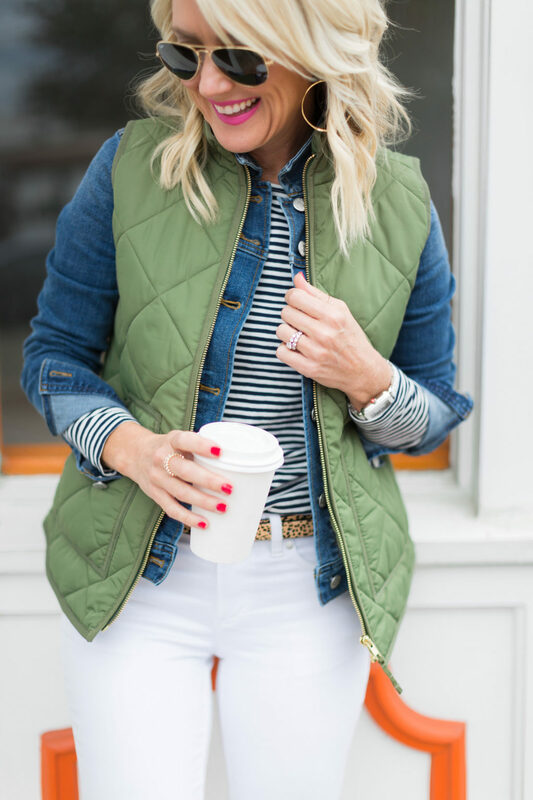 And you can find all my J.Crew Mercantile finds in my Amazon shop for fast, easy shopping! next article: A Day at the Fair! You are the QUEEN OF LAYERING, so I was thrilled to read your tips! 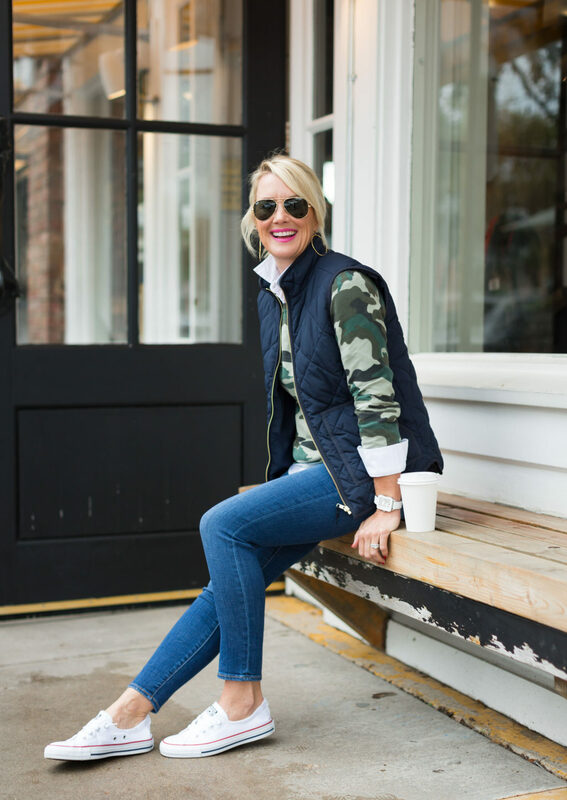 The camo with the white collared shirt underneath and vest on top is DARLING! The Stay Puft Marshmallow man, HA, HA. You forgot the Michelin Man! These tips work well for guys too. You should have thrown the hubby in the pics! Oh yes!! I knew there was another one I was thinking of!!! Boo hoo….the key pice of your first combo ..the cam sweatshirt is no longer available …nor is the puffer jacket. 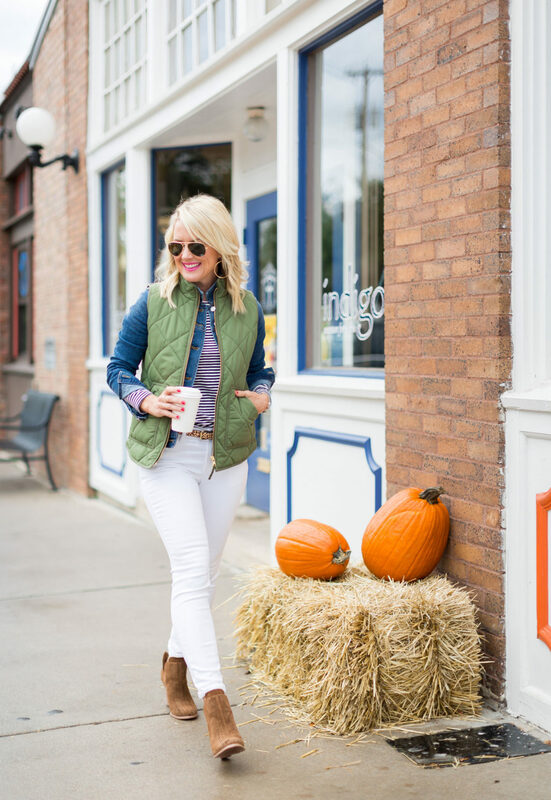 I live in vests during the fall and winter. And I love layering. I never thought about wearing a jean jacket then a vest. Genius! Can’t wait to try this. Love it. Thanks for sharing all your tips. yay! I’m thrilled you were inspired with something new today!! Cute! Cute! Cute! Pinned for future reference. 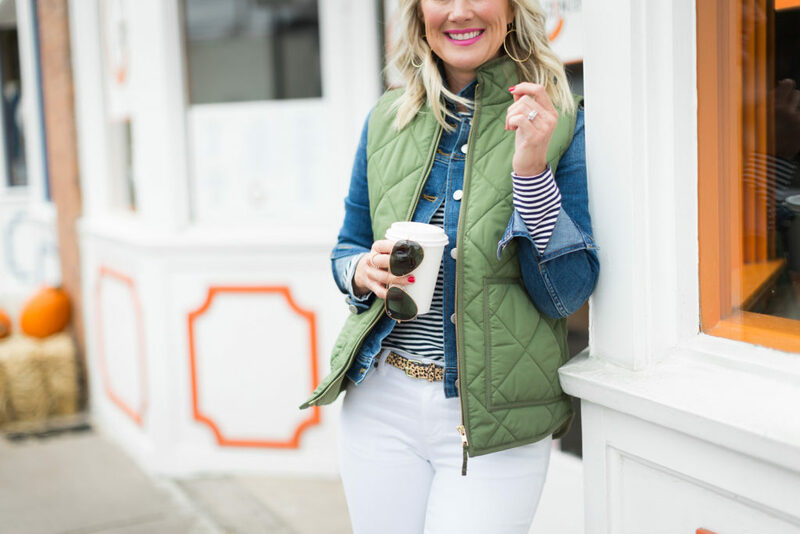 My favorite combo is the green puffer vest, striped shirt and jean jacket photo which brings out your blue eyes. Cute! Late question on a post. I cannot find anywhere the lotion you mentioned. Suave Professionals Moroccan Infusion. Where do you get yours from? Thanks so much!!!! Not sure this went through b/c I do not have a Website? Late, I cannot find anywhere the lotion you spoke of. Live in Dallas metroplex also……it is Suave Professionals Moroccan Infusion Body Lotion. Help! ;0) Thank you sooo much! Oh yes…that stuff is hard to find sometimes! It’s a grocery/drugstore find! I just look for any body lotion that has some sort of oil in it, that gives a nice glow and good hydration! Your tips on layering are so good. I don’t ever wear vests, I just can’t pull it off but now you got me thinking I should try again. 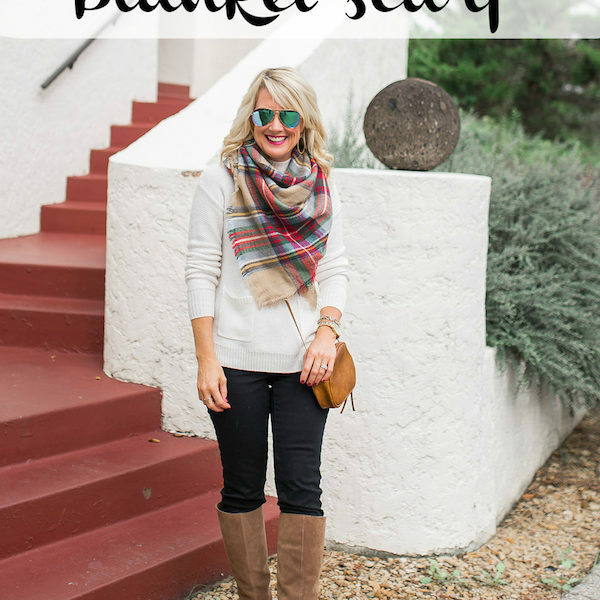 These quilted ones are a lot easier to wear bc they don’t add any puff or bulk! Thank you!! I love the combo….go for it! The weather in the GREAT Pacific Northwest is beautiful…sunny and days in the 70’s. The trees are amazingly lovely in their fall splendor. But don’t tell anyone, it is our secret! 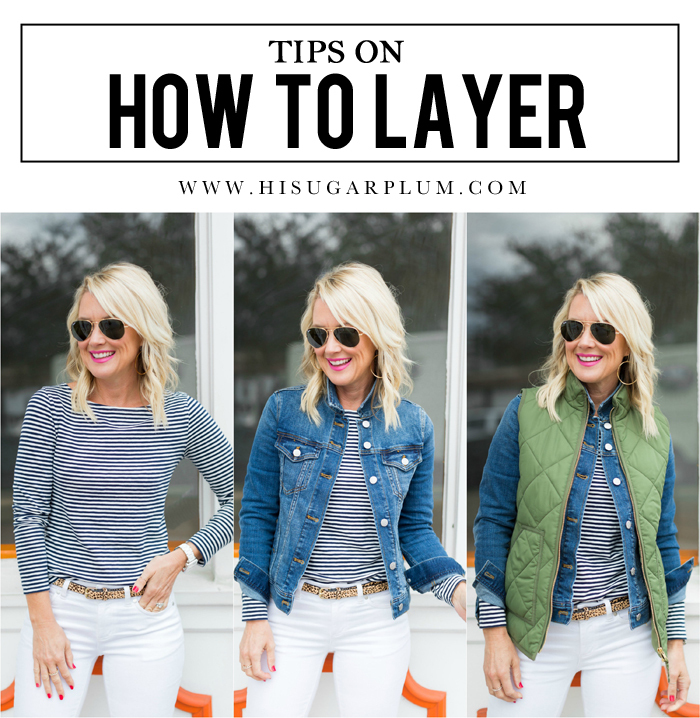 Great tips on layering! 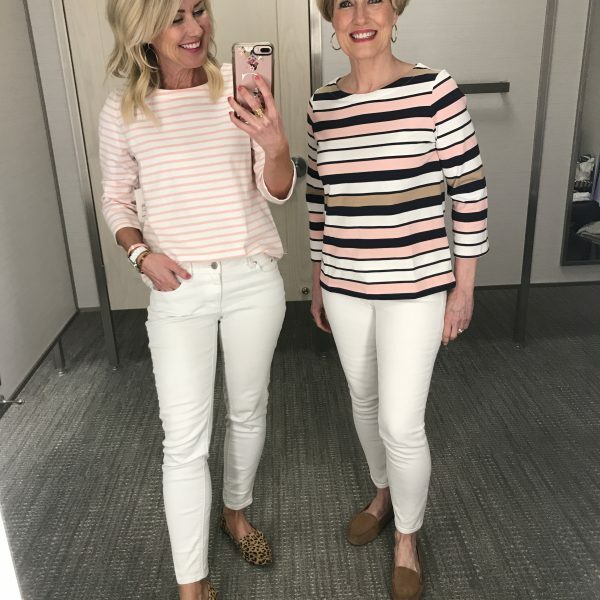 I love both outfits! …….unless you’re wearing layers because it’s actually quite cold outside!! 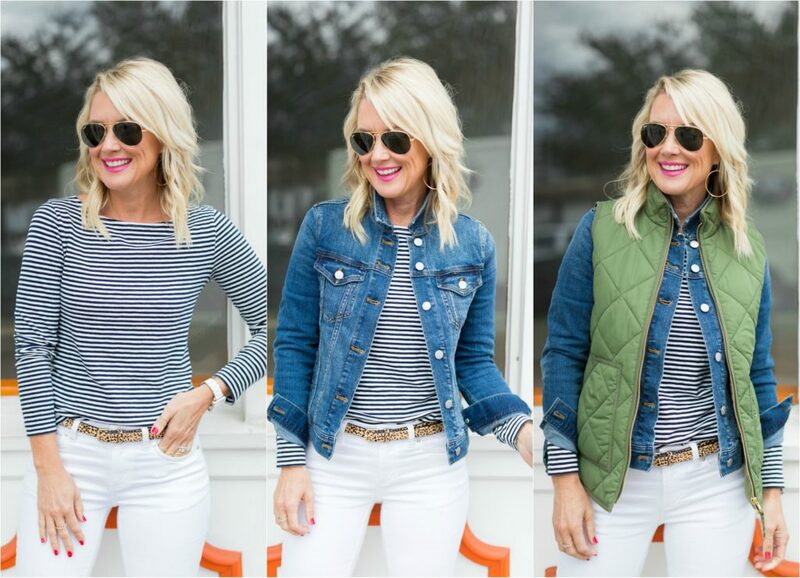 These seem like warm weather layering tips…..
Ha, yes…if it’s freezing out, all bets are off! But you can certainly open things up and shed the winter jacket once inside! I would love to have a styling session with you! I think your next give away should including helping someone figure out how to style what is already in their closet. Love your classic looks! Oh my gosh, that would be so fun!! I love playing dress-up in closets!! Yay! I’m thrilled it inspired you to create a new outfit! I LOVE your layered looks! And I have tried…and tried…and TRIED…and I can’t seem to pull it off! I look like a bag of busted BISCUITS!!! But I sure do love it on you!!! !